The Xbox 360 will be added Twitter and Facebook to its list of web services, Microsoft announced today, with some of those social networking services interact with the console's game library. Microsoft's Facebook implementation on the Xbox 360 looks to offer much of what's available via a regular web browser: status updates, photo sharing, email and more. 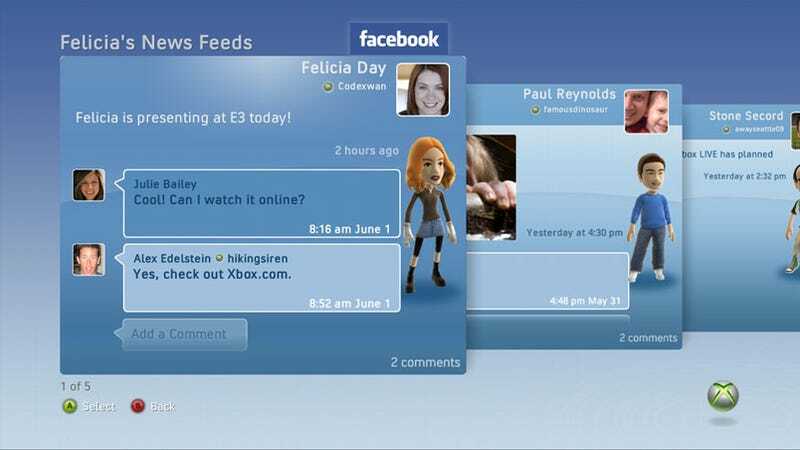 The interface follows the established New Xbox Experience format, with Avatars integrated into profile and news feed menus. Looks like more of the things one can do with the core Facebook service, installable apps notwithstanding, will be present in the Xbox 360 version. What's new is the option to save screen shots from Xbox 360 games, then let players upload those game moments via Facebook Connect to show off online. The first game to support that option will be EA Sport's Tiger Woods PGA Tour 10. Xbox general manager Marc Whitten said this feature will be added to the Xbox 360 SDK, but wasn't clear on whether this option could be added to older titles via software update. Xbox 360's version of Twitter looks very much like the Web interface, letting Xbox 360 owners update their personal status from the dashboard and favorite tweets. Microsoft also announced the addition of Last.FM to the Xbox 360 at its press conference today.